This could potentially eliminate the use of bowel (and its attendant morbidity) in urinary tract reconstruction. Potentially, such a bladder substitute could have mucosal, myogenic, and neurogenic attributes that approximate those of a functionally intact urinary bladder. Our proposal represents a concerted effort at establishing and developing this novel field of visceral tissue expansion. The search for the ideal tissue substitute for bladder augmentation is ongoing. Currently, intestinal segments remain most commonly used for bladder augmentation. Although the results of augmentation cystoplasty using various bowel segments have generally been acceptable, these tissues are associated with absorptive metabolic changes, mucus production, and stone formation, the magnitude of which is dependent on the length and segment of bowel used (34). Significant research in the past few decades has focused on alternative tissue substitutes for urinary tract reconstruction. These have included tissue-engineered materials, xenografts such as small-intestinal submucosa, and techniques such as autoaugmentation and de-epithelealized bowel (1-3). Some of these techniques, although promising, have either been insufficiently durable or require considerable refinement. The ureter, with its transitional epithelium, is potentially an optimal tissue for bladder augmentation (5). Augmentation ureterocystoplasty has been reported, with encouraging long-term urodynamic results, and limited, if any, metabolic changes. However, the amount of ureteral tissue needed to provide a urodynamically acceptable bladder augmentation can be obtained only in a patient with a large megaureter. Therefore, currently, augmentation ureterocystoplasty is limited to the occasional patient with a megaureter and a nonfunctioning kidney who requires bladder augmentation. Thus, although the potential for ureteral tissue expansion for urinary tract reconstruction has been demonstrated, further characterization of the biology of ureteral expansion and refinement of technique are necessary prior to its clinical application. The Desai study was designed specifically to address the following crucial issues: (i) the bGill et al., unpublished data. This approach has the potential to provide native, urothelium-lined tissue for augmentation or, possibly, replacement of the urinary bladder. 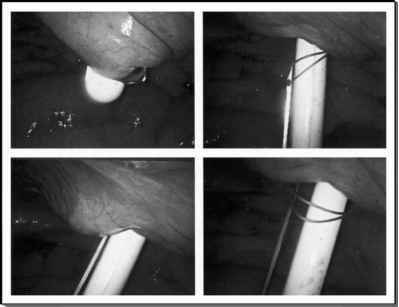 feasibility of percutaneous insertion of the ureteral expansion device; (ii) the efficacy of this novel balloon in expanding the ureter to the desired volume while simultaneously providing adequate drainage of the renal unit; (iii) a safe and reliable time line schedule and regimen for ureteral balloon expansion; (iv) the technical feasibility of performing laparoscopic augmentation ureterocystoplasty using the tissue-expanded ureter; and (v) the biologic nature of the expanded ureteral tissue and its efficacy in providing a uro-dynamically adequate bladder augmentation in a survival porcine model. Postoperative complications occurred in two animals. One animal, whose ureter was unstented, developed lower-ureteral stenosis, hydroureteronephrosis, and poor ipsi-lateral renal function, and the other animal had pyelonephritis with urosepsis. At autopsy, the animal with lower-ureteral obstruction revealed flimsy adhesion formation at the junction of the expanded ureter with the proximal normal-caliber ureter. There was no transmural fibrosis on histologic examination of the stenotic area. This obstruction probably represents cross-healing of the opposite ureteral walls following mucosal denudation during the expansion process and can potentially be avoided by stenting at the time of augmentation ureterocystoplasty until re-epithelization is complete. Our survival porcine study demonstrates that progressive, incremental ureteral tissue overexpansion can be carried out safely and reliably with a percutaneously placed expansion balloon. This ureteral expansion is well tolerated and can be performed over a 3- to 4-week period to create a sizeable reservoir for bladder augmentation. The expanded ureter is thick and vascular and reveals histologic and electron microscopic features of durable ureteral smooth-muscle hypertrophy and hyperplasia. This expanded tissue can be used laparoscopically to augment the bladder. Such augmented bladders possess good urodynamic properties over a three-month follow-up period. Concerted research in this arena will lead to further development of this novel field of visceral tissue expansion.